Beatrice, "The Girl Who Never Makes Mistakes," doesn't want to go skating with her friends, because she's worried she would slip and fall. She was once confident – she's good at just about everything after all – but an "almost mistake" has her worried that she's going to mess up. And that ruins all the fun for her...until she decides to just laugh at her big mistake. 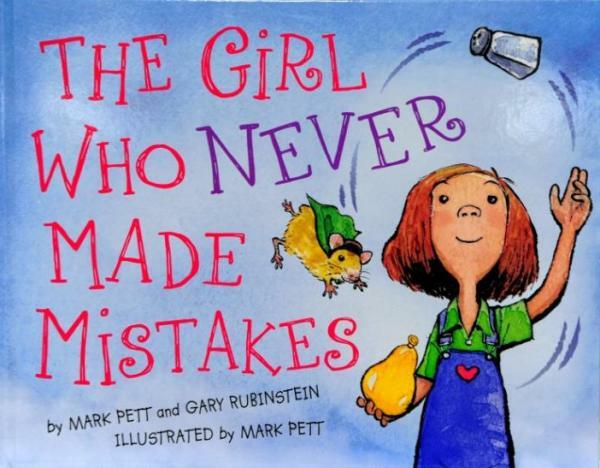 This is a wonderful book for any family with a perfectionist. If you have a son or daughter who can't stand making mistakes, then you know the sorts of troubles they can cause themselves. As they craft their latest work of art, a stray crayon mark can leave them crying, and insisting that now they have to start all over. The self-induced pressure can mount to the point that they don't even enjoy coloring (or whatever the activity might be) anymore. And they want try new things because they're afraid they'll be bad at them (which, of course, they will be, because to get good generally involves first being bad). For them, Mark Pett provides this gift - a mirror they can look into to spot their real flaw. And for parents it can serve as a short of "shorthand" – I know we've explained in the past to our perfectionist that she's ruining her own fun, but there's nothing like a story to make things clear to a child. And now, when she starts acting that way again, we can ask her whether she's pulling a "Beatrice." Oh, and I should add, the bright bold pictures, and funny storyline make this an enjoyable read for the non-perfectionist as well. You can pick it up at Amazon.ca here, and Amazon.com here.